After stopping for a break and some pizza in Greenwich Village, the Death March then proceeded east to Greene Street to work our way south to Church St and the WTC site (and then on to Battery Park, finishing the nearly 20 mile hike). This wasn’t completely planned (early routes had us traveling down Broadway), but this ended up working out quite well, since we happened across a Van Leeuwen Artisan Ice Cream Truck on Greene between Spring and Prince. 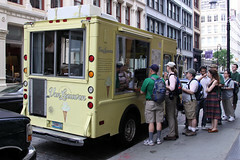 This wasn’t the first Van Leeuwen truck we spotted, there had been another over by the High Line, but this time everyone was in the mood for a short ice cream break. 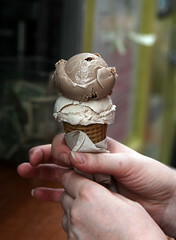 Van Leeuwen serves a number of premium ice cream flavors, with a nice thick, creamy ice cream base. Flavors run from the standard chocolate/vanilla/strawberry (although all are naturally flavored), with several nut- and spice-based flavors as well, including pistachio, hazelnut, and ginger. Both Carol and I opted for the combination of strawberry and gianduia (which is a blend of the chocolate and hazelnut ice cream). This was some good artisan ice cream. The texture was creamy, the consistency perfect with no extra air whipped in, and for both flavors you could really taste the fresh cream and the delicate notes of the flavor. As far as the flavors themselves, the strawberry was a little too delicate for my tastes (it was more of a “cream with strawberry hints” flavor), but the gianduia was sublime. The chocolate notes combined perfectly with the hazelnut notes in the same manner as Nutella, but keeping the nice soft creaminess without any greasy notes. The chocolate notes were strong, and it wasn’t overly sweetened, either. In short, it was a seriously good scoop of ice cream.